Each year, tuberculosis (TB) results in the death of 3 million people globally. In 2000-2020, an estimated 1 billion people will be infected, 200 million people will become sick, and 35 million will die from TB, if control is not strengthened. Radiologic features and pathologic correlation to the pattern of tuberculous infection in the GI tract is discussed in this article (see the images below). Overall, one third of the world's population is infected with the TB bacillus, but not all infected individuals have clinical disease. The bacteria cause the disease when the immune system is weakened, as in older patients and in patients who are HIV positive. The control of TB has been challenging because of the natural history of the disease and the varying pattern in which it manifests in different groups. 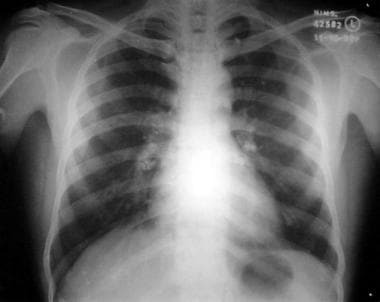 Chest radiograph reveals calcified hilar tuberculous lymphadenitis. 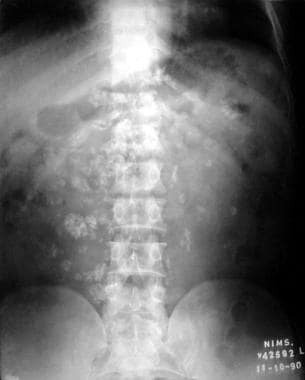 Plain radiograph of abdomen with diffuse calcified mesenteric lymphadenopathy in a patient with tuberculosis. Barium study shows marked narrowing of the body of stomach, which was proven to be gastric tuberculosis. Autopsies of patients with pulmonary TB before the era of effective treatment demonstrated intestinal involvement in 55-90% of fatal cases. The previously noted frequent association between pulmonary TB and intestinal TB no longer prevails, and only a minority of patients (< 50%) with abdominal TB now have abnormal chest radiographic findings. However, approximately 20-25% of patients with GI TB have pulmonary TB. Any part of the GI system may be infected, although the ileum and colon are common sites. The ulcerative form of TB is seen in approximately 60% of patients. Multiple superficial ulcers are largely confined to the epithelial surface. 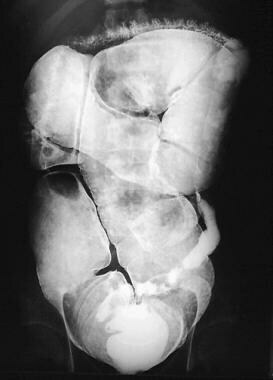 This is considered a highly active form of the disease, with the long axis of the ulcers perpendicular to the long axis of the bowel. The hypertrophic form is seen in approximately 10% of patients and consists of thickening of the bowel wall with scarring; fibrosis; and a rigid, masslike appearance that mimics that of a carcinoma. The ulcerohypertrophic form is a subtype seen in 30% of patients. These patients have a combination of features of the ulcerative and hypertrophic forms. Esophageal TB is rare, usually occurring because of spread from TB in the thorax either from mediastinal nodes, the lungs, or the spine. Esophageal TB is the least common site of TB in the GI tract. 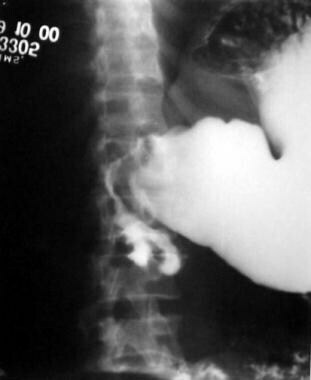 Dysphagia and retrosternal pain indicate esophageal involvement, with ulcerations just above the tracheal bifurcation. A rare granular form of TB occurs in miliary spread of primary TB. Common radiologic features include deep ulceration, intramural dissection, and fistula formation, especially in patients with AIDS. The ulceration can mimic esophageal malignancy with nodularity of the mucosa on barium examination. Mass and sinus tract formation can be better appreciated by using CT to assess extent of mediastinal involvement. Biopsy of the ulcerated mucosa reveals epithelioid granulomas. Stomach and duodenal involvement by TB is rare because of (1) the sparsity of lymphoid tissue in the upper GI tract, (2) the high acidity of peptic secretions, and (3) the rapid passage of ingested organisms into small bowel. Symptoms of stomach and duodenal involvement include abdominal pain and upper GI bleeding. Nausea and vomiting is a feature when gastritis and outlet obstruction are present. Duodenal involvement is seen with diffuse mucosal fold thickening, ulcers, or stricture formation or is complicated by fistulae. Simultaneous involvement of the pylorus and duodenum is a feature but is nonspecific for TB, because this feature is also seen in Crohn disease, lymphoma, and carcinoma. 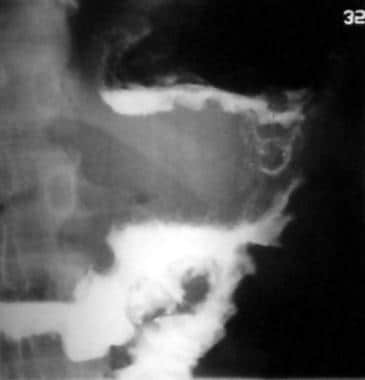 Barium examination reveals a long stricture of the duodenum caused by tuberculosis. Malabsorption may be caused by obstruction that leads to bacterial overgrowth, a variant of stagnant loop syndrome. Involvement of the mesenteric lymphatic system, known as tabes mesenterica, may retard chylomicron removal because of lymphatic obstruction and result in malabsorption (see the image below). Delayed image from follow-through series shows a collapsed colon and markedly distended long segment of ileum from chronic obstruction. This may represent tabes mesenterica. The ileum is more commonly involved than the jejunum. Ileocecal involvement is seen in 80-90% of patients with GI TB. This feature is attributed to the abundance of lymphoid tissue (Peyer patches) in the distal and terminal ileum. Proximal small intestinal disease is seen more commonly with Mycobacterium avium complex (MAC) infection, predominantly infection involving the jejunum. Intestinal obstruction may be partial or complete with TB. Segmental involvement usually is in a stenotic form. Crohn disease. 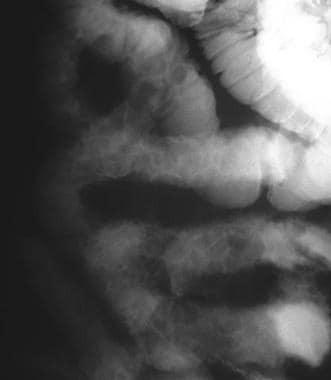 The radiologic pattern shows cobblestoning of the mucosal surface characteristic of Crohn disease. This is not a feature of tuberculosis. Characteristic ultrasonographic (US) features that indicate early changes of TB have been described. US features suggestive of intestinal TB are mesenteric thickness of 15 mm or more and an increase in the mesenteric echogenicity (from fat deposition) combined with mesenteric lymphadenopathy. However, these features also may be seen on sonograms in patients with Crohn disease; therefore, they become less specific for TB in a Western population. Radiologic features of intestinal TB in HIV-infected patients are similar to those in other patients (see the images below). The ileocecal region is the most common site of involvement, with thickening of the ileocecal valve, adjacent ileum, and colonic wall. 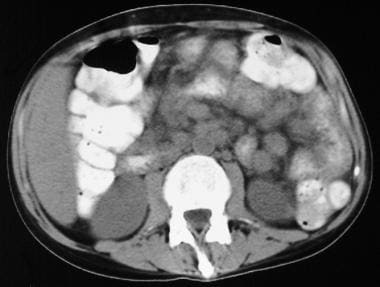 CT scans show mesenteric lymphadenopathy with a hypoattenuating center suggestive of necrosis. Distinguishing M tuberculosis from MAC infections in patients with AIDS may be possible. Diffuse jejunal wall thickening and enlarged soft-tissue–attenuating lymph nodes with hepatosplenomegaly suggest disseminated MAC infection, whereas focal abdominal lesions with low-attenuating lymph nodes suggest disseminated M tuberculosis. MAC infection is also called pseudo-Whipple disease because of the diffuse mucosal fold thickening in the jejunum and histiocytic aggregates infected with MAC that stain positive with periodic acid–Schiff testing. Barium meal follow-through series reveals gross dilatation of distal ileal segments in this British-born patient of Asian origin with malabsorption. He had visited Pakistan once 15 years ago. Lymphoid masses found at surgery were proven to be intestinal tuberculosis. 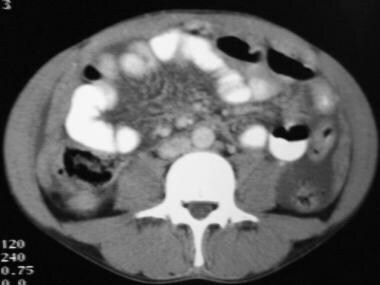 CT scan of the abdomen in a patient with AIDS shows edematous jejunal loops and extensive lymphadenopathy, which was proven to be a Mycobacterium avium intracellulare infection. CT scan in an HIV-positive patient with intra-abdominal tuberculosis (TB) shows ascites, marked omental thickening in both flanks, and stranding in the mesentery. Courtesy of Zahir Amin, MD. Colonic TB is most often associated with ileal TB. The involvement is segmental and especially involves the right colon. Symptoms include weight loss, fever, and pain in the right iliac fossa, with a palpable mass and diarrhea. Radiologic features include a combination of narrowing, deep ulceration, and mucosal granulation producing nodularity and inflammatory polyps. Less common findings are aphthous ulcers and a diffuse colitis. Changes are usually noted in the ascending and transverse colon. Bowel contour may be lost with asymmetry simulating Crohn disease. When a short segment is involved, the strictures are hourglass-shaped rather than the apple-core deformity associated with carcinoma. In some cases, they may be indistinguishable. The ileum empties into a deformed cone-shaped cecum at right angles with hypertrophy of the ileocecal valve (Fleischner sign). Fistulae and sinuses may occur but are rare. The cecum may be pulled upward with fibrosis. Differentiating Crohn disease from TB before treatment is initiated is important, as steroid therapy can be catastrophic in patients with undiagnosed TB. CT demonstrates colonic wall thickening with spiculations, transmural fibrosis, and lymphadenopathy. The presence of necrotic lymph nodes excludes a Crohn disease diagnosis, while findings of wall stratification, comb sign, and fibrofatty proliferation suggest Crohn disease. If doubt exists and if imaging findings cannot definitively differentiate GI TB from Crohn disease and other inflammatory disorders, laparoscopy with a targeted biopsy is currently considered the most rapid and specific method for diagnosing GI TB. TB is a well-recognized cause of rectal stricture in the Asian population. Isolated rectal involvement is rare and may be mistaken for rectal malignancy. The measurement of ascitic fluid adenosine deaminase levels is a major advance in the diagnosis of tuberculous peritonitis, which should be considered when dealing with exudative ascites. Laparoscopic biopsy samples from the peritoneum should be stained for acid-fast bacilli (AFB), and cultures should be obtained. Where laparoscopy is not available, percutaneous peritoneal biopsy and diagnostic ascitic tap (if ascites are present) for microbiologic and biochemical examination should suffice. Peritoneal biopsy is also helpful in nonascitic cases. Findings are positive in 42% of patients with abdominal TB. The most common site of GI TB is the ileocecal region, if the area can be reached with a flexible endoscope. A rapid diagnosis can be achieved if smear or culture results are positive or if caseating granulomas are seen in biopsy samples. In countries where GI TB is endemic, a therapeutic trial of antituberculosis treatment may be justified if the clinical picture is compatible with TB. Krishna S, Kalra N, Singh P, Kochhar R, Gupta R, Singh R, et al. Small-Bowel Tuberculosis: A Comparative Study of MR Enterography and Small-Bowel Follow-Through. AJR Am J Roentgenol. 2016 Sep. 207 (3):571-7. [Medline]. [Full Text]. Stojkovic M, Müller J, Junghanss T, Weber TF. Radiological Diagnoses in the Context of Emigration: Infectious diseases. Rofo. 2018 Feb. 190 (2):121-133. [Medline]. [Full Text]. Kentley J, Ooi JL, Potter J, Tiberi S, O'Shaughnessy T, Langmead L, et al. Intestinal tuberculosis: a diagnostic challenge. Trop Med Int Health. 2017 Aug. 22 (8):994-999. [Medline]. [Full Text]. Tripathi PB, Amarapurkar AD. Morphological spectrum of gastrointestinal tuberculosis. Trop Gastroenterol. 2009 Jan-Mar. 30(1):35-9. [Medline]. Lin PY, Wang JY, Hsueh PR, Lee LN, Hsiao CH, Yu CJ, et al. Lower gastrointestinal tract tuberculosis: an important but neglected disease. Int J Colorectal Dis. 2009 Oct. 24(10):1175-80. [Medline]. Park SH, Yang SK, Yang DH, Kim KJ, Yoon SM, Choe JW, et al. Prospective randomized trial of six-month versus nine-month therapy for intestinal tuberculosis. Antimicrob Agents Chemother. 2009 Oct. 53(10):4167-71. [Medline]. [Full Text]. Williford ME, Thompson WM, Hamilton JD. Esophageal tuberculosis: findings on barium swallow and computed tomography. Gastrointest Radiol. 1983. 8(2):119-22. [Medline]. Sharma V, Rana SS, Chhabra P, Sharma R, Gupta N, Bhasin DK. Primary esophageal tuberculosis mimicking esophageal cancer with vascular involvement. Endosc Ultrasound. 2016 Jan-Feb. 5 (1):61-2. [Medline]. [Full Text]. Nagi B, Lal A, Gupta P, Kochhar R, Sinha SK. Radiological findings in duodenal tuberculosis: a 15-year experience. Abdom Imaging. 2015 Jun. 40 (5):1104-9. [Medline]. Makanjuola D. Is it Crohn's disease or intestinal tuberculosis? CT analysis. Eur J Radiol. 1998 Aug. 28(1):55-61. [Medline]. Hussain T, Salamat A, Farooq MA, Farooq A, Hassan F, Hafeez M. Indications for endoscopic ultrasound and diagnosis on fine-needle aspiration and cytology. J Coll Physicians Surg Pak. 2009 Apr. 19(4):223-7. [Medline]. Ozbülbül NI, Ozdemir M, Turhan N. CT findings in fatal primary intestinal tuberculosis in a liver transplant recipient. Diagn Interv Radiol. 2008 Dec. 14(4):221-4. [Medline]. Barreiros AP, Braden B, Schieferstein-Knauer C, Ignee A, Dietrich CF. Characteristics of intestinal tuberculosis in ultrasonographic techniques. Scand J Gastroenterol. 2008. 43(10):1224-31. [Medline]. Kalra N, Agrawal P, Mittal V, Kochhar R, Gupta V, Nada R, et al. Spectrum of imaging findings on MDCT enterography in patients with small bowel tuberculosis. Clin Radiol. 2014 Mar. 69 (3):315-22. [Medline]. Radin DR. Intraabdominal Mycobacterium tuberculosis vs Mycobacterium avium-intracellulare infections in patients with AIDS: distinction based on CT findings. AJR Am J Roentgenol. 1991 Mar. 156(3):487-91. [Medline]. Epstein BM, Mann JH. CT of abdominal tuberculosis. AJR Am J Roentgenol. 1982 Nov. 139(5):861-6. [Medline]. Jain R, Sawhney S, Bhargava DK. Diagnosis of abdominal tuberculosis: sonographic findings in patients with early disease. AJR Am J Roentgenol. 1995 Dec. 165(6):1391-5. [Medline]. Yang ZG, Min PQ, Sone S. Tuberculosis versus lymphomas in the abdominal lymph nodes: evaluation with contrast-enhanced CT. AJR Am J Roentgenol. 1999 Mar. 172(3):619-23. [Medline]. Heller T, Goblirsch S, Bahlas S, Ahmed M, Giordani MT, Wallrauch C, et al. Diagnostic value of FASH ultrasound and chest X-ray in HIV-co-infected patients with abdominal tuberculosis. Int J Tuberc Lung Dis. 2013 Mar. 17 (3):342-4. [Medline]. Limsrivilai J, Shreiner AB, Pongpaibul A, Laohapand C, Boonanuwat R, Pausawasdi N, et al. Meta-Analytic Bayesian Model For Differentiating Intestinal Tuberculosis from Crohn's Disease. Am J Gastroenterol. 2017 Mar. 112 (3):415-427. [Medline]. [Full Text]. Barium examination shows loss of normal orientation and displacement of jejunal and ileal segments in a young Asian boy; this finding suggests mesenteric disease due to tuberculosis. 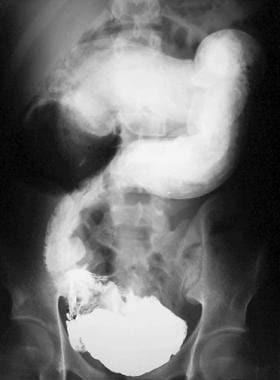 Barium meal follow-through study in a patient with stricture of the ileocecal region extending into proximal ascending colon.